This book provides a basic guide to the study of the printed matter which has been produced in the United States. No comprehensive attempt has been made to record the great bulk of research in this field. Recognizing the need for an up-to-date guide to such investigations, G. Thomas Tanselle has compiled a listing of the principal material dealing with printing and publishing in this country. In his Introduction, Tanselle surveys the research which has attempted to trace the history of printing and publishing in America from its inception to the present and explains how this material can be utilized effectively. In nine carefully arranged categories he covers bibliographies of imprints of particular localities; bibliographies of works in particular genres; listings of all editions and printings of works by individual writers; copyright records; catalogues of auction houses, book dealers, exhibitions, institutional libraries, and private collections; retrospective book-trade directories; studies of individual printers and publishers; general studies of printing and publishing; and checklists of secondary material. From the mass of material, an appendix selects 250 titles. Although the work is arranged so that the reader may easily locate relevant sections, a comprehensive index provides further aid in finding individual items. 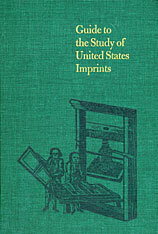 Guide to the Study of United States Imprints is a reference tool designed to serve both as a guide to research and as a practical manual for use in identifying, cataloguing, and recording printed matter. It will be of enormous value to scholars in American literature, history, and bibliography, to librarians, typographers, and bibliophiles, and to antiquarian book dealers and book collectors.